Just for Fun..Can I Connect Data Collection and the Chicago Style Hot Dog? My name is Gayle DeRose and I am in the high-tech business. Data Collection. Data Acquisition. Rugged computing solutions. I am the COO at L-Tron Corporation, and we partner with the best in the business: Advantech, Honeywell Scanning & Mobility, and Zebra Technologies, just to name a few. I do routinely blog about our business. And today I have been inspired to blog. But let’s forget about L-Tron for a minute. 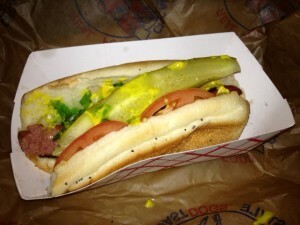 My inspiration for today is… The Chicago Style Hot Dog! Now, don’t get me wrong. I am health conscious with my every day food choices, BUT airports are the exception (and frankly I look forward to every opportunity). Recently, I was traveling back from California on a pleasure trip to see my brother for a few days. I was up at 3:30 am and on the road at 4:20 am for the 15 mile drive to catch my 8:15am flight – gotta love the Cali traffic. As my excellent luck would have it, I had a layover… in Chicago! Aww yeah! I even started thinking about my Chicago Style Hot Dog the night before. Would I be able to find one? Could I restrain myself and eat JUST one??? The flight was uneventful, with no delays- a nice surprise. We landed on time. GAME on! Immediately upon landing I texted the arrival gate to my husband (he was at work in Rochester, NY at the time). Intel text arrived shortly after. Despair immediately set in. Was he joking? What had I done to deserve this? I would have to choose between grabbing my hot dog or making my flight? Hmmm, that’s a tough one. But hang on…my phone was buzzing. New text! Now that’s what I’m talking about! Truly I would expect to find a Chicago style hot dog at EVERY terminal gate in the Chicago airport, I don’t get that! Off I went. I walked and walked…and walked…and walked, carry-on in hand, reminding myself that all of this effort would be worth it. And 5 minutes later it was over, with only pleasant memories and a photo to remember my Chicago style hot dog. So, can I tie this blog to data collection or industrial computer solutions? I will have to think harder on that. However, I think I would rather savor the moment – I am content and full!